Enjoy locally-sourced food while sipping your favorite beverage in our pub-style sports bar & restaurant or outside on our beautiful patio. 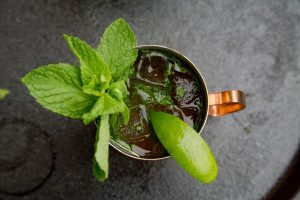 Featuring a full service bar, including a vast selection of craft beer (featuring many local breweries), a wide variety of wines and specialty hand-crafted cocktails. Watch your favorite sports team while enjoying your favorite beverage. With multiple screens throughout the bar, including an extra-large projection screen for optimal viewing, you’ll never miss a play! Enjoy our spacious patio, which will shade you with umbrellas on the sunniest days and warm you with firepits and heaters on cool evenings. 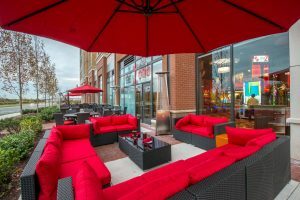 Relax with family and friends in one of our two luxurious outdoor seating areas and you’ll feel you’re on a mini-vacation. 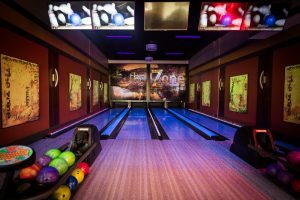 Eat and drink in our unique Strike Zone while bowling on our cosmic bowling lanes and watching your favorite sports team on our massive 18-foot screen. Reservations are highly recommended. 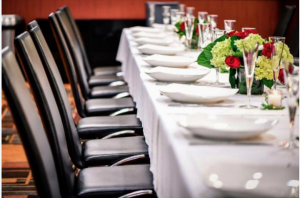 Plan your next dinner party, birthday party, retirement party, bachelor/bachelorette party, or baby/bridal shower here and we’ll provide an exceptional experience for you and your guests. Our private dining options include accommodation for up to 75 people. Unwind with us Sunday through Thursday from 3 pm till 7 pm, Friday extended Happy Hour 3-9pm and enjoy special pricing on food and drinks.